Roast turkey... okay I've done this a couple of times and have developed a bit of a method. If you can, get a fresh turkey from a turkey farmer. One of my old students used to raise free range turkeys near Sundre, Alberta. The flavour is much better and you don't have to go through the labour of thawing it, which can take up most of your holiday. But finding a turkey farmer may not be easy wherever you are. So, assuming you've got a frozen bird, the most important thing is to make sure it is FULLY thawed. This takes either 1 day per 5 lbs (in the fridge) or 30 minutes per 1 lb in the sink with luke warm water. (Both take a long time). Make sure the bird's cavity is well cleaned out, including the 'giblets' sack. After the bird is fully thawed, I do use a brine. Usually a cup of sugar, a cup of kosher sea salt, and about eight litres of water. Usually a large pot or cauldron will work...keep the bird in this over night in the fridge before cooking. (An industrial size cooler is handy). 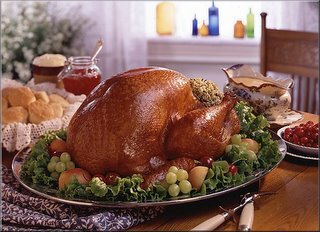 When you are ready to cook, pre-heat your oven to 325 degrees F.
Take the bird out of the brine and drain, pat dry with paper towels. I use a local bakery's rye, raisin, and walnut bread for my stuffing... along with sweet vidalia onions. Use whatever stuffing you see fit... you may choose to make more separately after the bird is done with the juices. I coat the bottom of the roaster with extra virgin olive oil and sliced spanish onions (in fairly thin rings), as well as sprigs of fresh rosemary. Put the bird in the roaster on top of this base. Optional decadence: Cover the whole surface of the bird (including drumsticks) with strips of thick-cut bacon. (It will not imbue a bacony flavour, but will keep the meat juicy and act as a self-basting feature). Tent the whole roaster with aluminium foil, leaving at least an inch of space between the foil and the bacon-covered bird. For cooking times, here are your guidelines: 8-12 pounds, 2 ¾ to 3 hours; 12-14 pounds, 3 to 3 ¾ hours; 14-18 pounds, 3 ¾ to 4 ¼ hours; 18-20 pounds: 4 ¼ to 4 ½ hours. Take the bird out, (if you've used it) remove the bacon - or chop it up and mix it into your stuffing! (if you've used the bacon, after removing it, baste the turkey and put it into the oven for another 5 minutes just to give it that golden patina. posted by Matthew Francis | 12/20/2005 10:42:00 a.m. He really did put the hours in with Julia and the Frugal Gourmet. All the beauty of living I've learned from my wife and my sister!